This morning a magnetic toy called The CyberCube arrived on my doorstep. After opening it up and playing around with it for a few minutes I initially wanted to throw it out the window – as trying to create shapes seemed rather frustrating, mainly due to the strength of the magnets. I couldn’t even work out after destroying the perfect 6 x 6 x 6 cube, pre-built in the box, how to rebuild it. However once you give it a little bit of time and patience you can actually do some rather creative geometric 3D and 2D designs. It also is a lot more relaxing and stimulating than I initially thought – with so many possiblilties it offers hours of playtime. 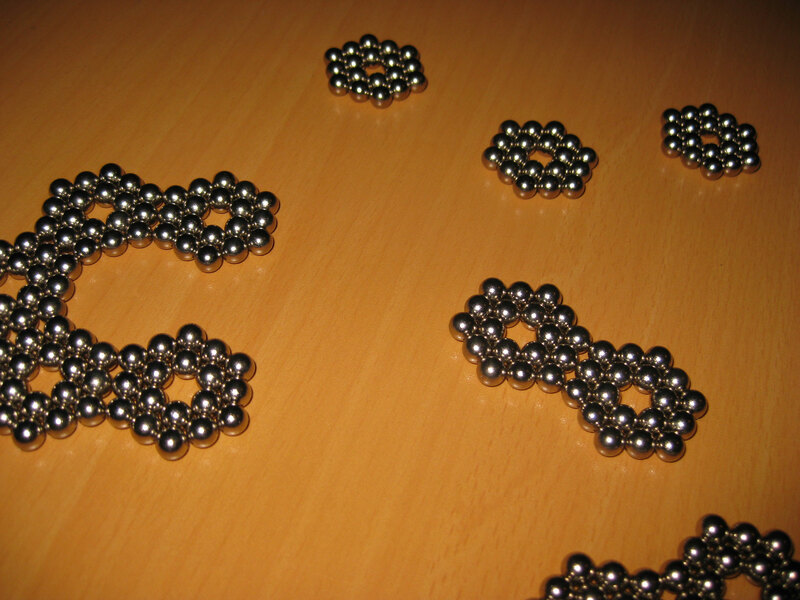 The CyberCube consists of 216 small neodymium ball magnets – and boy are these strong magnets considering they only 0.6cm in diameter! Trying to show off – remember I have only had it for a day. This is my routine for building up the cube – let me know if you know of a more elegant way to do this? I’m hooked this is a great toy and very stimulating. Warning: bare in mind that this consists of small, strong magnets and shouldn’t be purchased for younger kids who might think about putting them in their mouths. However, I think this is a great gift to have on your desk at home or at work, especially as when it’s not being played with it actually looks rather cool. You’re currently reading “The CyberCube”.